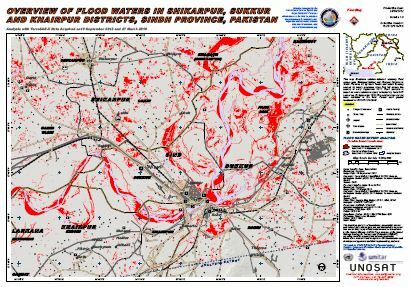 This map illustrates satellite-detected standing flood waters over Shikarpur,Sukkur and Khairpur Districts in Sindh Province hit by flash floods and urban flooding caused by heavy monsoon rains that fell across the country in early September 2012. Flood analysis is based on crisis satellite imagery collected by TerraSAR sensor on 19 September 2012.This analysis has not yet been validated in the field. Please send ground feedback to UNITAR /UNOSAT.